Should Bear Baiting, Use of Dogs Be Banned? The following editorial appeared in The Oakland Press (Michigan) on October 14, 1996. Are you fed up with all the hunters telling you to leave wildlife management decisions up to the experts at the Department of Natural Resources? Enough already! If everyone hasn't figured it out by now, the "experts" at the Department of Natural Resources are not experts. They're hunters. Their friends and families are hunters. And hunting pays their salaries. So, since one of their two goals is to preserve current unscientific bear hunting practices—even though bear baiting and the use of dogs in hunting is unethical and ignominious—it shouldn't surprise anyone that goal number two is to keep decisions about hunting out of the public's hands. 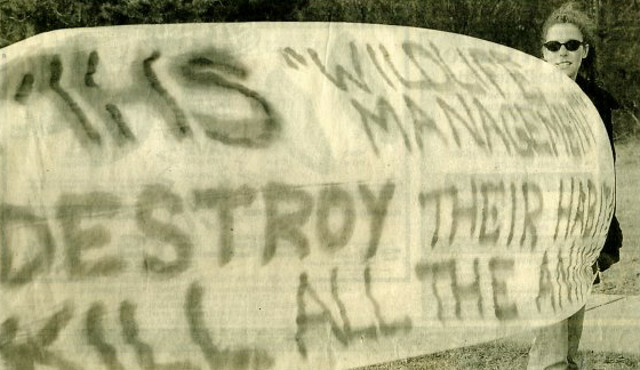 When did killing more animals, and killing them more easily, become sound wildlife management? If they were unbiased and sincere about protecting wildlife, they would be preventing habitat encroachment, poaching and hunting altogether. According to any authentic wildlife expert who doesn't have to worry about pleasing special interest groups, the truth is that hunting causes overpopulation. For instance, if hunting wasn't practiced, then there would be an even ratio of male (buck) and female (doe) deer. So, without hunting, a sample group of 10 deer would consist of five bucks and five does. Since each doe can have up to two offspring, then the maximum number of babies born in the sample group is 10. So, hunters kill the bucks a majority of the time and not the does. Why? Because females make babies. And, due to hunting, the sample group of 10 deer is now at a disproportionate level. Instead of five bucks and five does, there is now (on average) one buck and nine does. That means a maximum number of 18 offspring could be produced. Multiply the extra eight babies for every sample group of 10 deer and there you have it. An overpopulated herd so hunting can continue. Lynn Rogers, Ph.D., and retired wildlife biologist with the U.S. Forest Service, says humans and bears can co-exist peacefully. "The residents of Hemlock Farms, Penn., share their seven-square-mile town with over 20 black bears. That's three bears per square mile, a higher density than is found in any national park." We should be outraged that the people making decisions on the welfare of animals don't care about animals. The DNR must stop kowtowing to the hunting coalition. The DNR needs to do what it should have been doing for years—protecting our wildlife from killers and protecting our habitat from development. The public is sick and tired of placing any governmental decisions in the hands of biased individuals. We have the right to say what happens to these precious animals. Michigan residents should vote yes on proposal D and no on G.
The following editorial appeared in The Oakland Post (Oakland University's school paper) on November 13, 1996. The forest was quiet and serene as the sun attempted to shine through countless trees. A panoply of animals roamed peacefully. A hunter, claiming to love and respect animals, waits in a tree blind with his Winchester high-powered rifle. An altruistic animalitarian (sic), who also claims to love and respect animals, stands motionless by a tree with his Minolta X-700 camera. A buck trots along foraging for berries. He stops at some brush. His large brown eyes, moist black nose and tan-colored fur embellish his presence. The animalitarian is content witnessing a living, breathing being in its natural habitat. He snaps a round of shots from his Minolta. He leaves and realizes that humans aren't the only creatures on earth; they just act like it. Co-existence and respect for life are essential to kind, compassionate humans. But wait! The hunter sees the same creature. He recognizes nothing but the buck's inferiority to humans. A tasty venison burger is on his mind. His heart races for the thrill of the kill. He aims his Winchester at the deer's heart. The buck is clueless to this frightful act because the hunter is hidden. One shot is fired. Bam! The buck takes it in the chest. He falls and drags himself a few hundred feet before dying. The hunter is content. He has taken a life, but not one of his own. He feels no remorse. His abstruse mind-set is inexplicable. He has never heard the poignant quote from Thomas Edison: "Non-violence leads to the highest ethics which is the goal of all evolution. Until we stop harming all other living beings, we are all still savages." Nor has he heard from the benevolent Gandhi: "The greatness of a nation and its moral progress can be judged by the way its animals are treated." Unfortunately, hunters have been nourished by a society that fails to acknowledge the innate freedoms that every being deserves. The right to make decisions about your own body. Rights that are not open to debate. Yet, humans miserably fail to extend these rights to non-human animals. And, since animals cannot speak human languages, altruists will speak for them. No, they do not want to be murdered while roaming in the woods with their families. No, they do not want to be slaughtered over a pile of jelly doughnuts. Furthermore, the Department of Natural of Resources (DNR) in Michigan, or any other state's resource commission, is reluctant to tell people the truth about hunting. Hunting causes overpopulation. Hunters always say that deer are overpopulated, and they hunt to keep the population down. Then how come the population never gets under control? If hunting wasn't allowed, then there would be an even ratio of male (buck) and female (doe) deer. So, without hunting, a sample group of 10 deer would consist of five bucks and five does. Since each doe can have up to two offspring, then the maximum number of babies born in the sample group is 10. However, now that hunters have landed positions in the DNR and are forced to please the hunting coalition, they must keep the herd overpopulated. So, hunters kill the bucks a majority of the time and not the does. Why? Because females make babies. And, due to hunting, the sample group of 10 deer is now at a disproportionate level. Instead of five bucks and five does, there is now (on average) one buck and nine does. That means a maximum number of 18 offspring could be produced. Multiply the extra eight babies for every sample group of 10 deer and there you have it. An overpopulated deer herd and hunting season can continue on schedule. Another fact to consider in the scandalous overpopulation methods employed by the DNR is the issue of deer-car accidents. If hunting controlled the herd, then how come deer-car accidents rose from 35,000 in 1975 to more than 60,000 in 1995? Hunters have been killing an average of 300,000 deer each year. That's 2.7 million over the last 20 years. Deer-car accidents should be decreasing, right? Then, there's the pesky issue of habitat destruction and human proliferation. Not to mention the fact that humans have made wolves, natural predators of deer, an endangered species. If given a chance, and some space to live, animals can co-exist peacefully with humans. In the Nov/Dec 1996 issue of Animals magazine, Gary Alt, who headed a 1996 bear-tagging study for the Pennsylvania Game Commission, said, "Nothing has impressed us more than their (bears') incredibly unassertive behavior. We've been shocked at how wild bears can adapt to high human densities..."
In the same issue, Vermont bear biologist Forest Hammond informed readers of the following statistics: "Since the turn of the century (1900), fewer than 30 people have been killed by black bears in all of North America. Compare that toll with the 5,000 people killed by bee stings and 2.5 million people killed by other people during the same period." Who is the aggressor—animal or man? The sincere words of British naturalist Charles Darwin: "The love for all living creatures is the most noble attribute of humans." So who loves and respects animals? The hunter or the altruist? The following letter-to-the-editor appeared in The Oakland Press (Michigan) on August 17, 1997. The U.S. Agency for International Development (USAID) is using $28 million of our hard-earned tax dollars on a program known as Campfire, which promotes trophy hunting of African elephants, leopards, lions and other threatened species in order to generate revenue for rural villagers in Zimbabwe. USAID was also a leader in the effort to weaken international protections for elephants and to reopen the trade in ivory last month. The Humane Society of the U.S. firmly believes that this recent move to downlist elephants will once again invite poachers to conduct their deadly campaigns to steal elephants' tusks. Campfire also owns more than 10 tons of stockpiled ivory and will earn over $1 million off its sale to Japan. All residents who are concerned about this situation should contact their U.S. representative and ask them to support the Fox amendment to HR 2159. The amendment will ensure that no tax dollars go to trophy hunts or to promote trade in ivory or rhino horns. The following satirical editorial appeared in The Oakland Post (Michigan) on November 19, 1997. Hunter: Buy a rifle and get a hunting license. Then hunt down the animals and kill them. Hunter: Well, some of the weak ones starve to death. And that's a very cruel way to die. So—instead—hunters shoot some deer, cut off their heads for trophies, dismember their bodies and eat their flesh in order to save them from the cruelties. Boy: But, uh, uh, how come hunters never shoot starving deer, only big healthy ones? Boy: You mean most of the people who work for the DNR hunt? Hunter: Yes, of course, boy. And those fees from the hunting licenses—around 90 percent of that money goes toward the hiring of DNR officers and the marketing of programs to recruit young people, like yourself, into the hunting community. Hunter: You mean the Natural Resources Commission? Hunter: Let me get this right, boy. You mean, we should just conserve some of the land and some of the animals that live on that land for the heck of it. With no killing. Uh, that would be a pretty kind gesture of humanity. Boy: You mean tell people to have compassion for those who have no compassion? The following excerpts appeared in The Oakland Press on February 13, 1999. An animal rights activist picketed the Michigan Humane Society offices insisting the burgeoning deer herds in the Huron-Clinton Metroparks should be left alone. The park board approved preliminary plans this week to shoot deer to reduce the population at Kensington Stony Creek and Hudson Mills metroparks. Gary Tiscornia, director of the Humane Society, said he opposed hunting the deer, but if deer must be killed to control the population, use of a sharp-shooter is considered a humane form of euthanasia. "That was the last straw," said Gary Yourofsky, president of the animal rights group picketing the Humane Society facility on Auburn Road Friday. "Tiscornia is a deceptive sycophant and hereby condemned as a traitor to the animal protection movement," Yourofsky said. "The animal rights movement will accept nothing less than his immediate resignation." Tiscornia couldn't be reached for comment on Friday. Yourofsky said he will continue the protests outside the Humane Society. "They want to save plants out there, but not the animals?" Yourofsky asked. "Nature will regulate itself. The only wildlife management that should be going on is humans staying out of the animals' area." The headline above, and photograph and caption below, appeared in The Oakland Press on February 14, 1999. The following excerpts appeared in The Oakland Press on February 19, 1999. If the courts don't save hundreds of deer at Kensington Metrokpark, a group of local animal rights activists promised it will. Gary Yourofsky, of ADAPTT, said the group will seek an injunction early next week against a preliminary plan to kill deer at Kensington, as well as at Stony Creek and Hudson Mills metroparks. "I can assure everyone that the deer in Kensington will not be shot," Yourofsky said. "The metroparks are going to lose this battle." Park administrators hope to resolve a number of issues before a final recommendation for deer kills is made by the Huron-Clinton Metroparks Board of Governors in late summer. In Milford Township, they will need a temporary lifting of a 1991 ordinance that prohibits the use of firearms in and around Kensington. Yourofsky, who said the injunction will be filed in either US District Court in Detroit or a circuit court, warned the animal rights group's fight will not end if the courts do not support its case. "If need be, we'll go back to civil disobedience," Yourofsky said. "We'll make it so difficult for them to kill the deer that they will not be able to do it." Yourofsky was one of five Michigan people charged with releasing more than 1,500 mink from a southwestern Ontario mink ranch in March 1997. He faces charges including breaking and entering, theft and mischief. He will stand trial early next month. The following article appeared in The Oakland Press on July 13, 1999. Seventy-seven days in a Canadian detention center won't stop Gary Yourofsky from civil disobedience for animal rights. "I can't wait to get arrested again," Yourofsky said Monday after being deported from Canada. "I was able to live—firsthand—the caged existence that animals go through." The 28-year-old Royal Oak resident was jailed by Canadian authorities April 27 after being convicted of breaking and entering at an Ontario mink farm. Yourofsky freed 1,500 of the minks in the 1997 incident. He was sentenced to serve 180 days but was released early and deported. "Two customs agents picked me up at the detention center and handcuffed me," Yourofsky said. "They drove me to the border and dropped me off on the American side." He said he now plans to oppose the hunting of deer at metroparks, a plan that was approved last week. "I'm going to be out there," he said. "I hope to have others with me, but I'll do it alone if I have to." As part of his mink sentence, he was ordered to pay $35,000 in restitution, but has refused. "I won't pay money to a mink murderer," Yourofsky said. The following excerpts appeared in The Oakland Press on November 6, 1999. Hunters killed nine deer the first day of a controlled archery hunt at Stony Creek Metropark, despite protests by animal rights activists who had hoped to stop the hunt. About 35 people were lined up outside the main entrance at Stony Creek on 26 Mile Road, holding picket signs and chanting "Nugent's boys must go," in reference to rock guitarist and hunter Ted Nugent. Nugent, who did not attend the hunt, was the most prominent target—a song with the chorus "the day Ted Nugent killed all the animals" came from a portable tape player at the side of the road. "Ted Nugent's boys are getting away with murder," said Kristine Simon of Chelsea, a co-director of Michiganders Against Sport Hunting (MASH), the group that organized the protest. Jodi Louth of Saline, also of MASH, said the controlled hunt should have been called off because Gary Yourofsky, a Royal Oak animal rights activist, infiltrated the hunt area of the park. Dave Moilanen, a spokesman for the park authority, said the protesters had spread the Yourofsky rumor in order to disrupt the hunt. "If you have an apple tree with too many branches on it, you prune it to get better apples," said Chuck Buzzy, president of the Metro Wildlife Management Base, a consortium of conservation groups coordinating the hunt. Alma Gilette of Sterling Heights wasn't buying that argument. She held up a sign protesting the hunt. "I love the animals and I want to see the animals," she said. "I'm against the hunting of the deer in the park." Robert Penskar of Chelsea objected to the control measures. "I abhor what will happen out here today," he said. "They are going to bowhunt deer, which to me is a travesty. These deer are in a park which people like to see. It's supposed to be peaceful—instead, they are turning it into a killing field." MASH's Louth blamed pressure by hunters for the HCMA's decision to use hunting as a management tool. "The HCMA were cowards for caving in to hunting pressure, and the hunters today are cowards for participating," she said. The following article appeared in The Macomb Daily (Michigan) on July 14, 2000. There's growing opposition to plans to remove a herd of deer from a wooded area on the grounds of the GM Tech Center property in Warren. The company plans to develop the pristine 312 acres along Mound Road between 12 and 13 Mile Roads, but must first deal with the deer, estimated to be between several dozen and 100. Some animal rights activists and members of the Warren City Council say they will oppose any efforts to remove or euthanize the creatures. "This is the last place in Warren where these animals can live unharmed and unfettered. I don't understand what kind of legacy GM wants to leave here," said Gary Yourofsky, president of ADAPTT. The issue was scheduled to be discussed at Tuesday night's council meeting in Warren, but was tabled because GM officials are on vacation and could not attend. Ann Klein, the council secretary, said some GM leaders told her they have no plans to kill the deer. She said other council members are publicizing the issue for political reasons. "General Motors is conducting studies on how to handle the deer and they will have a nature center there," Klein said. "This was in poor taste to bring this topic up when GM is not here to defend themselves." GM spokesman Gerry Holmes has not returned phone calls in the past week, but in the past, he has been quoted as saying the automaker will decide the most humane option for the herd. GM workers and some residents who live near the site feed the deer by hand on the trails of the fenced-in property. If the company decides to move the deer, it will either truck them away, airlift them out or tranquilize the animals. None are good solutions, said Sue Neal of the Michigan Humane Society. Neal, a wildlife specialist, said the stress of the relocation could be fatal to the deer. After studying aerial photographs of the area, Neal favors natural dispersion, allowing the creatures to run free along the Red Run Drain. "I would be against relocation because it would be fraught with difficulty. It pains me to see the high amount of suffering with a low probability of success for this effort," Neal said. But Anne Fracassa, chairwoman of the Warren Animal Commission said the automaker has indicated it will create a refuge area for the deer. "From what we know, much of the deer can safely be transferred to another section of the site. But the development likely is five years down the road," she said. Council members James Fouts and William Barnwell also expressed concern over the animals. "I happen to watch them every day from behind my house and I'll fight for those little deer," Barnwell said. Fouts offered a plan that includes an independent study to determine the effects of development on wildlife in that area. The following excerpts appeared in The Oakland Press on August 11, 2000. 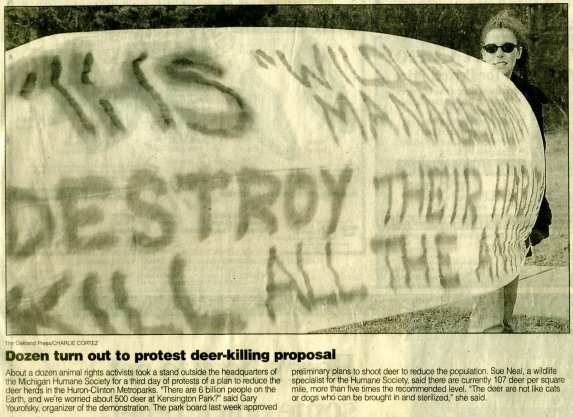 Deer at area metroparks are safe—right now and perhaps for the rest of this year—from the killing that provoked protests and controversy in 1999. The board of commissioners for the Huron-Clinton Metropolitan Authority failed Thursday to pass a metroparks white-tailed deer management plan for 2000-01. The deer management proposal likely will come up again—possibly at the authority's Sept. 14 board meeting—but Director Frank Sudek said a delay could jeopardize any management plan for 2000-01. Judy Brock, president of the Metroparks Deer Preservation Council, a group that opposed last year's deer kills, saw Thursday's meeting as a slight turn in her group's direction by some of the commissioners. "We are pleased that some of the commissioners are questioning some of the points we made from the beginning," she said. The group, which has advocated non-lethal control measures such as surgical sterilization, contraceptive drugs, trapping and relocation and fencing, had questioned whether the deer were having a devastating effect on park vegetation. More than 20 people spoke during Thursday's meeting at Metro Beach Metropark, the majority against the proposed deer management proposal. Gary Yourofsky, an animal rights advocate from Royal Oak, said he would form a "rogue independent police unit" to stop any lethal control measures in the metroparks. "I'm fed up with the so-called experts who work for the Dept. of Natural Resources, the Natural Resources Commission and the HCMA justifying unsound fun for people who commit cowardly acts," he said. He later interrupted (commissioner William) Kreger, who was trying to explain why he felt the deer needed to be controlled. The following excerpts appeared in The Detroit News on November 9, 2000. Animal lovers are threatening violence if that's what it takes to stop General Motors and Warren from removing a herd of 70 deer from the GM Tech Center. "These deer are my family. If they harm my family members, I will retaliate—I am willing to get arrested," said Gary Yourofsky, one of 50 people picketing at City Hall on Wednesday over the move. "I will use force to defend deer like I would defend my mother or sister. I'll do whatever it takes and I'm not alone." Marci Hannah, 47, doesn't think GM will save the deer she has learned to love. "It's too late to change their mind. Now I just want them to tell us the truth," Hannah said. Florence Robbie, 87, said it was too cold for her to be out protesting but she had a point to prove Wednesday. "I'm upset," she said before joining a chorus of "Keep the Land, Save the Deer." At least eight police cars came to watch over the angry protest after Yourofsky entered the lobby of Mayor Mark Steenbergh's office. He ignored Steenbergh's aides and yelled "cowards" at them after learning the mayor wasn't there. They marched and chanted near the clerk's and treasurer's offices before marching into the Tech Center. Six Pinkerton security officers called Warren police supervisors and locked the Tech Center gates shooing protesters off the property. No one was hurt or arrested. Passersby honked horns and pumped their fists in support, even when protesters walked in front of them with signs that said "The Buck Stops Here," "Boycott GM" and "Loud and Clear, Keep All the Deer." The next protests are next week at Steenbergh's home and at Tuesday's City Council meeting, Yourofsky said. "We want to do civil and uncivil disobedience because this whole thing stinks to high heaven," Yourofsky said. Officials acknowledge deer could die from the stress of the move from Warren, but believe they're doing what's best. Protesters don't think so. "This whole thing has hunting farm written all over it," Yourofsky said. "The city is a puppet of GM and GM is directly killing deer and other animals by destroying their habitat." The following editorial appeared in The Detroit News on April 20, 2001. The first one is from Mohandas Gandhi. "The life of a lamb is no less precious than that of a human being. The more helpless the creature is, the more it is entitled to protection from humans from the cruelty of humans"